The first two articles in this work have identified what Loki ultimately symbolises in our mythology: the energy of illusion and all that springs from it. We have also seen that those who set down much of our myth in the written word often subverted or attempted to obscure the essential wisdom, either from some deliberate intent or through a lack of any real experienced understanding. Either way an unfortunate result has been that many who sincerely believe they adhere to the Odinist religion have actually absorbed this false myth. There are, as we know, some who actually give blot to Loki. A few of these do so because basically they are immature and get a thrill thinking they are being ‘dark’ etc. and most of these types will grow out of it, though a few unfortunately will become immersed in negativity on a longer lasting basis. But most of the ‘Loki toasters’ are basically unknowing and have swallowed the false myth and not yet perceived reality. 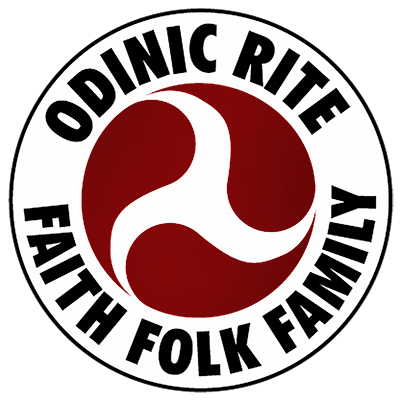 It is not the business of the Rite to directly meddle in other groups ways, its their right to do as they wish, but it is very much our business to continue to build a serious and dedicated Odinist movement and community. In this way, though we are primarily concerned with the OR being a positive vehicle for our glorious faith to manifest on Midgarth, our influence also becomes very powerful on Odinism/Asatru in general, as has already been the case. As far as I am aware, we are the first organisation to unequivocally make it clear the ‘Loki worship’ has no place in our religious practice and it is wholly negative (obviously as Loki is illusion and negativity). Recently one or two other groups have now adopted this line as a direct result of the OR policy on this. Possibly they wont wish to acknowledge the Rite’s influence in this publicly, but we can be pleased to know that on this issue at least, such groups now present a positive philosophy also. This final part will deal with another error sometimes displayed. I will say it seems to be very much a minority outlook and is not as widespread as some of the other misconceptions (the blood brotherhood nonsense for example) but still it is worth our correction. This error concerns the creation myth. Askr and Embla empty of fate. Heat gave Lodur and healthy hue. Now of course the creation myth itself is a subject to study in its own right, but for the purposes of this article we are concerned only with dispelling the misconception that sometimes arises like a noxious boil, that Loki played any role in it. Some scholastic writers, such as HA Bellows, have theorised that the rather mysterious Lodur is in fact Loki under a different name. This theory however while possibly academically clever, is false. Lodur, whenever mentioned in the myths is always a positive and benevolent being. His gift to the myths first man and women of our folk is ‘heat’ and a ‘healthy hue’. Lodur is a fire God in one aspect and one level his very name being linked to the German ‘Lodern’ which means ‘to blaze’ as was noted by Jacob Grimm among others. Loki also has a fire aspect on one level and this led in time to a confusion of the two. Skaldskaparmal cemented this confusion when it changed the creator trio of Gods from Odin, Hoenir and Lodur to Odin, Hoenir and Loki. In some skaldic verse Loki is given the eke name of ‘staunch friend of Hoenir’. But of course it is ridiculous to ascribe the obviously beneficent qualities of Lodur to Loki. Though both on one level, fire beings, it is important to remember Lodur is a God of beneficent fire while Loki is a force of destructive, baneful fire. Loki in no away at all is a friend to the Gods, let alone a ‘staunch friend’. From his very inception he works to destroy the Gods and men, he is wholly malignant and negative. Lodur’s gifts to humanity are of course totally positive, Loki is the force of illusion which is ignorance and from which all harm ultimately flows, it is inconceivable that the original myths (which go back to the earliest of Indo European times) would ascribe such a negative entity with a role in the creation of the manifestation in Midgarth of the Holy energy of the High Gods, no ‘gift’ Loki gives is ever genuinely well intended. Loki the ‘living shame to everyone’ is absolutely not a benevolent deity. However due to the fact that both Lodur and Loki have a fire aspect and possibly also due to what some may see as a similarity of name, over the great period of time from our myths first inception in pre-historical times, and with the loss of real awareness and understanding of the essence of our myth (as alluded to in my earlier article Cycles of Time) this confusion arose and they became seen (by some) as one and the same being. The whole fire aspect of both is worthy of separate consideration, but that is for another article. Suffice to say that Lodur is representative of beneficial fire and heat, while Loki, naturally epitomises destructive, baneful flame on this level of the myths. Lodur and Loki are in fact opponents, not one and the same. We can also remember that Heimdal also has an aspect of a beneficent fire God. Throughout our myths Heimdal is an implacable foe of Loki and at Ragnarök they ‘slay’ each other. Heimdal is also deeply involved with our folk’s creation under the guise of Rig, he created the social order. We say ‘gather round ye children of Heimdal’. The similarities between Lodur and Heimdal are in fact so great that it is in fact Heimdal who is almost certainly the same divine being as Lodur. It is important that we of the Rite do not allow this misconception that Loki, the force of negativity, the energy of illusion, played any role in creating our folk, to flourish. On all levels, within ourselves as individuals, within our Holy Movement, within our folk – may we play our part in the binding of Loki.